Beloved and I went to an event last night. But, before going to the venue, we passed by a nearby Slice n’ Dice steakhouse nearby. I’ve eaten in this franchise before at different branches—particularly the Visayas Ave., Kalayaan, and Katipunan branches, so I pretty much know what to order and what to expect. I’ve also eaten here while they were still named “In n’ Out”, so I pretty much know that this place has been around for quite some time. The particular branch we went to is found at Timog Avenue at the section closer to GMA. This is basically a budget restaurant specializing in T-bone steak. The prices are quite affordable with generous serving sizes, so it’s always one of those places we go by every once in a while. While the gist of their menu is the T-bone steak, they do have sides and other dishes. Beloved ordered for herself their Cream Dory with Rice and drink (132 Php). 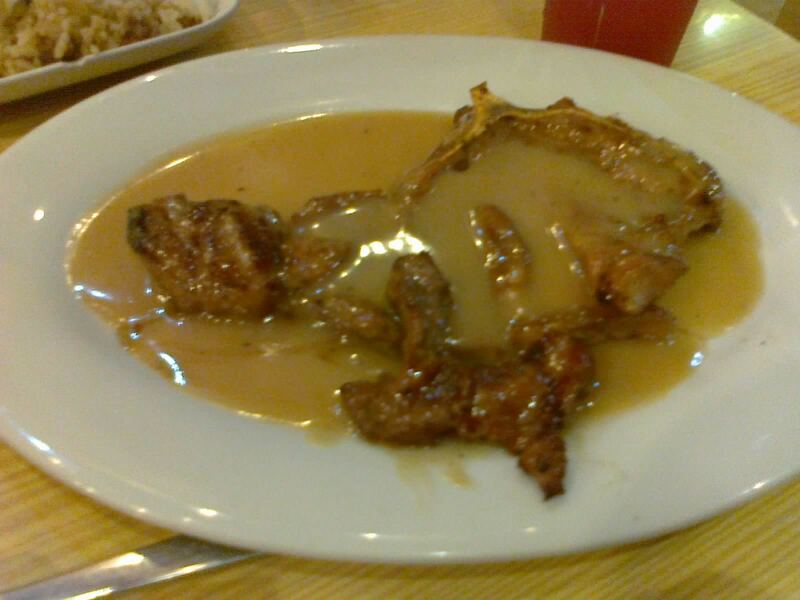 I ordered their regular T-Bone Steak (99 Php), which doesn’t come with anything. That in mind, I also ordered their Sirloin Rice with a drink (62 Php) and mistakenly ordered the larger serving of their Kangkong Stir Fry (95 Php). Basically all of our orders arrived all at once, so I’ll start with my T-Bone. Because this is a budget restaurant, the quality isn’t as great as those tender, falling-off-the-bone expensive kind. In fact, the meat is pretty chewy and tough at some parts. That aside, this sizable 99 Php plate is pretty much guaranteed to sate your hunger. The gravy is pretty tasty as well. However, steak aficionados would realize this isn’t really a T-bone, as the tenderloin part of the steak is missing. This is just the tougher short loin meat, I personally find more suitable to be called “L-bone”. 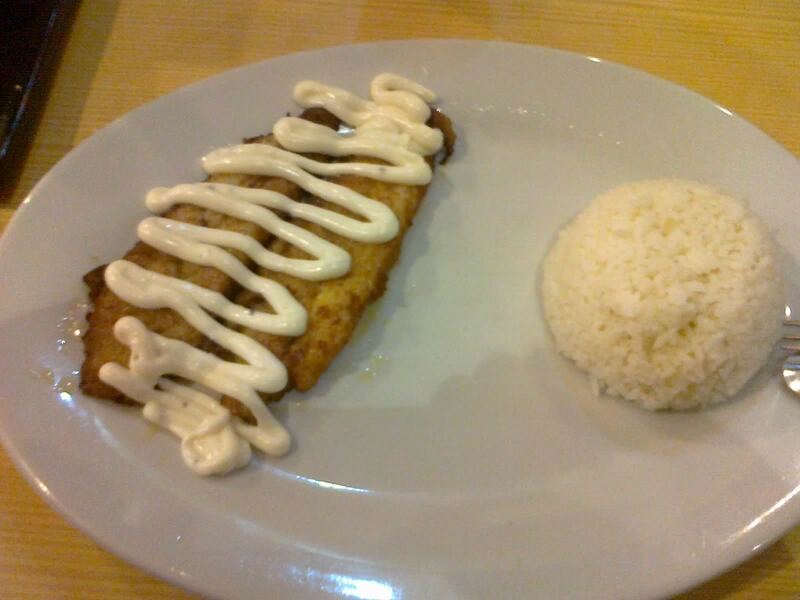 Beloved’s Cream Dory is covered in mayonnaise served with a cup of rice. The good thing about this is they really used cream dory, complete with its expected creaminess and fishiness. Sadly, the amount of mayonnaise didn’t really do much. Perhaps the dish would’ve been better if the sauce was separated. Still, it was one of the cheapest cream dory plates we’ve had at 120 Php without drinks. My Sirloin Rice was pretty sizable as well. 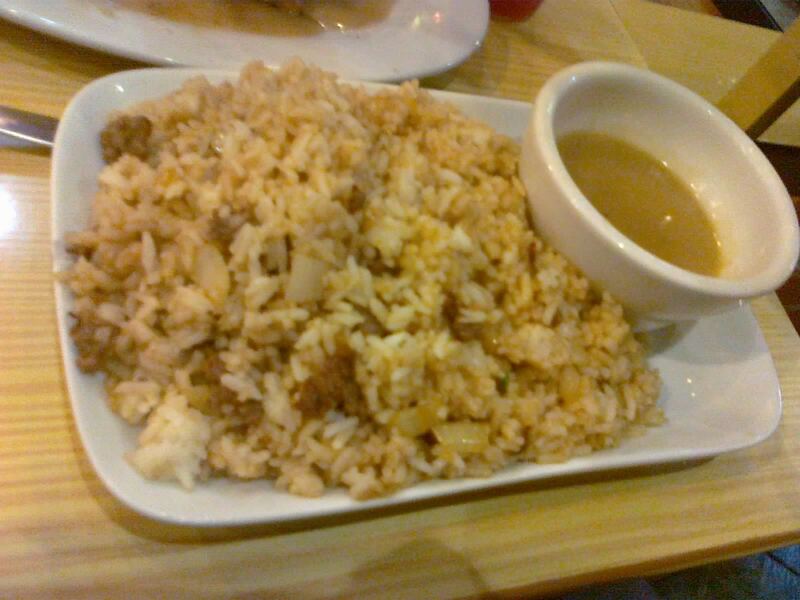 This is well over two cups of rice, maybe three, served with bits of meat and onions mixed in. It comes with their tasty gravy that some might find this plate good for an entire meal. I was only able to finish about two thirds of the plate. Don’t expect much, though—the meat they use is similarly tough and pretty much bland as their steaks. 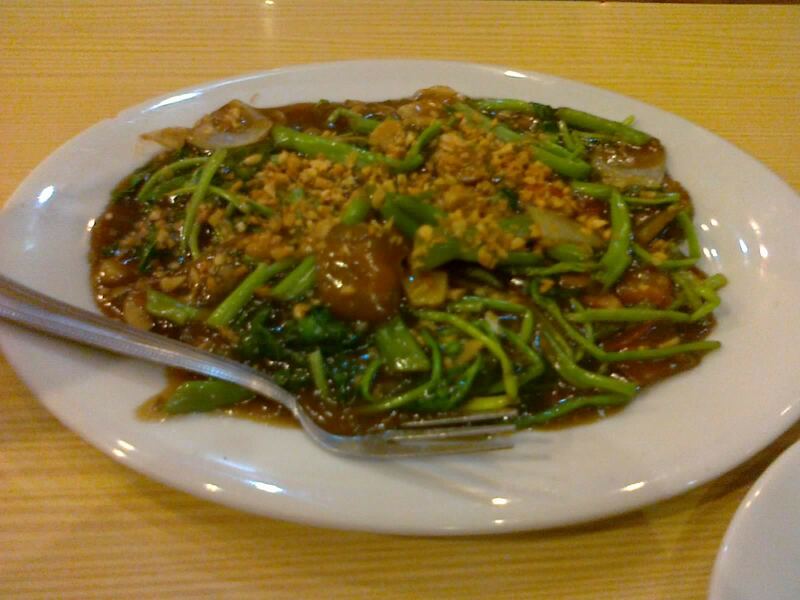 Lastly, but certainly not the least, their Kangkong Stir Fry is a decent size as well. Of course, I meant to order the 65 Php incarnation which is about half of this one. That mistake aside, it’s the tastiest plate among our orders this night. They probably use some kind of oyster sauce in the stir fry, which makes for a very tasty sweet-and-sour and garlicky sauce. The crunchy texture of the kangkong is what I like most about this veggie, and perhaps is my favorite vegetable next to mushrooms which is also incorporated in this dish. Aside from the aforementioned mushrooms and kangkong, there are peppers and onions as well. This is one of the places where you get what you pay for—in a good way. You’re pretty much guaranteed to be full for less than 200 Php, far less than most other restaurants have to offer. The quality, of course, isn’t the greatest, but none of the food I’ve tried here so far turned out bad. This is especially true if you’re hungry, as hunger is the best spice. If you’re starving and are certain that the usual fast food fare wouldn’t fill you up, there’s bound to be a Slice n’ Dice nearby… well, at least within a one digit kilometer radius. And going here is never a bad decision, especially if you’re on budget. Recommended for: Hungry budget carnivores and/or kangkong lovers. Not recommended for: Exquisite steak lovers. Smart nomnomnom tip: Meat too bland? They have Worcestershire, soy seasoning, and hot sauce at the table in addition to the incorporated gravy (which, I believe you can ask for extra).